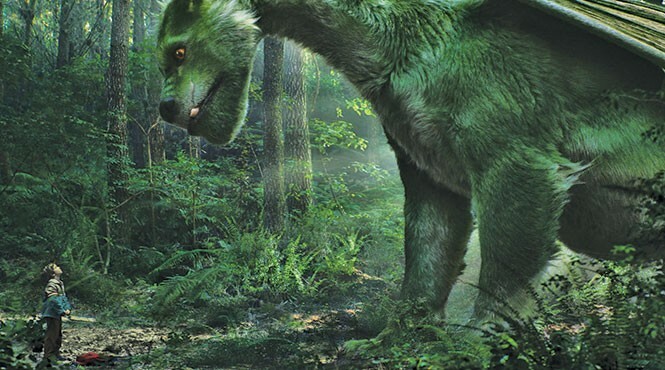 Pete's Dragon makes for a charming improvement over the original. Something interesting has happened with regard to Disney's remake of Pete's Dragon, or more precisely, something interesting hasn't happened: Nobody is crying bloody murder about it. While Disney has turned self-cannibalizing its library of family classics into its current identity, there's always room for an exception. The 1977 version of Pete's Dragon emerged from an era where it's amazing that the Disney brand didn't disintegrate completely, as the company alternated between goofy live-action fare and occasional animated features—or, in the case of the original Pete's Dragon, combined the two. When people scoffed at Disney stamping "classic" on everything released during the area of clamshell-covered VHS tapes, this was exactly what they were scoffing at. If there's a case where the 21st-century epidemic of cinematic regurgitation is most justified, it's when a fundamentally sound original concept was turned into something with a recognizable name, but negligible quality. Co-writer/director David Lowery takes the raw material of the original Pete's Dragon and shapes it into something utterly distinctive—and not just because the dragon is now CGI instead of a hand-drawn cartoon. Indeed, the premise here bears virtually no resemblance to that of the original, opening with a car accident that orphans a pre-school-age boy named Pete and leaves him alone in the woods. He's found there by an intelligent, furry green dragon that Pete names Elliot—after the puppy in his favorite picture book—and which becomes Pete's caretaker. Six years later, the now mostly-feral Pete (Oakes Fegley) is found by forest ranger Grace (Bryce Dallas Howard), and brought back to civilization. And Elliot's need to find Pete may threaten to expose his existence to the residents of the nearby logging town. Lowery might not have seemed like an obvious candidate for this job—his highest-profile previous feature was the R-rated Sundance outlaws-in-love drama Ain't Them Bodies Saints—but the smartest thing the Disney brain-trust did was allow Lowery to work to his strengths. Pete's Dragon doesn't play coy with showing us Elliot, allowing the relationship between Pete and Elliot to develop early and effectively. Lowery crafts that relationship through playful, largely wordless sequences of the boy and his friend, resulting in something that recalls the gentle magic of Carroll Ballard's 1979 The Black Stallion rather than the frantic desperation of so many family adventures. There's also more than a whisper of E.T. in the story's structure—and if there's anywhere Pete's Dragon stumbles, it's here. The primary antagonist becomes lumber mill boss Gavin (Karl Urban)—the brother of Grace's fiancé, Jack (Wes Bentley)—who becomes determined to trap Elliot. But Gavin's character never makes very much sense, as though somewhere in another draft of the script, he was either a broader villain or a more complicated character driven to his actions by financial worries. As necessary as it may have been to raise the stakes and inject some action into the otherwise contemplative story, Gavin takes up a lot of screen time that might have been better spent on Grace's father, Meacham (Robert Redford), who has his own mythologized history with the "Millhaven Dragon." Not even those plot contrivances, however, can spoil the charm and emotion that Lowery builds into the relationships of Pete's Dragon. He doesn't overplay the idea that childless Grace somehow needs to be a surrogate mom to Pete to complete her life, leaning instead on the sympathy resulting from her own motherlessness. And the friendship between Jack's daughter Natalie (Oona Laurence) and Pete remains simple and uncomplicated by some Mowgli-esque effort to turn it into proto-puppy-love.